The US city of Eugene, Oregon will host a deluge of athletes from all over the world for the 2014 IAAF World Juniors Championships July 22 – 27. As these athletes descend on Hayward Field, venue of the event, track and field fans can brace themselves to witness some spectacular and at times downright breath-taking performances. As usual, the hottest competition will feature events that are two laps and shorter, and no doubt will be centered on archrivals and track and field sprints nemeses USA and Jamaica. The big news coming out of the USA in high school track and field surround a 16-year-old Florida sophomore (2nd year ), Kaylin Whitney. Only a few weeks ago, she ran against Olympians and other professionals over 200m and posted an eye-opening winded-aided 22.80sec., defeating some professionals in the process. 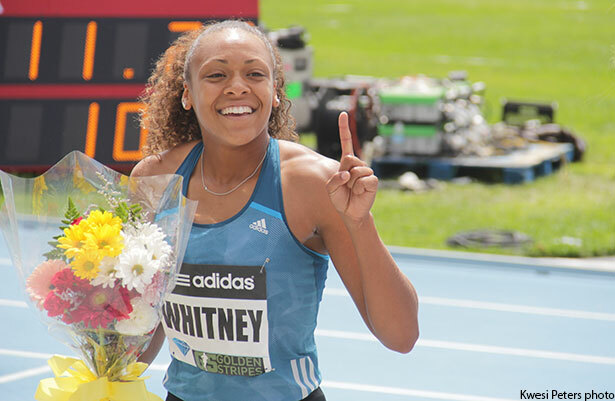 As if to show that her performance was no fluke, Whitney returned to the track in a record breaking mood at the recently concluded USATF World Juniors Trial, where she broke Marion Jones’s long-standing high school under-17 100m record of 11.14secs with a blistering 11.10 (+0.9) – a new USA high school national record. In the 200m she scorched a talent-laden field that included university students and crossed the finish line in an amazing time of 22.49 (+1.3). 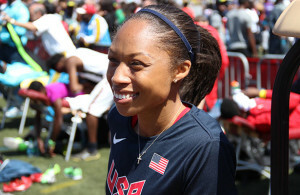 That time broke the legendary Allyson Felix’s 2003 record of 22.51 at low altitude. In the Boys 200m, USA is hoping for a gold medal performance from North Carolina native Trentavis Friday, who ran 20.03 sec (+2.9mps) at the USATF Junior Trials. Though the time was wind-aided, it is considered the fastest 200m time that an American high school athlete ever recorded. The Jamaican boys will be led by the formidable 2013 World Youth 200m champion Michael O’Hara of Calabar High School, who booked his place on the team when he ran 20.96 (-2.0) at the Jamaica Junior Trials on June 15. Last year he clocked 20.62 to win in Donetsk, Ukraine Championships. O’Hara will be accompanied by 17 other strong male team members such as St. Jago High’s 400m specialist and 2013 World Youth champion Martin Manley and 100m and 200m sprinter Jevaughn Minzie of Bog Walk High School, who is in supreme form this year.